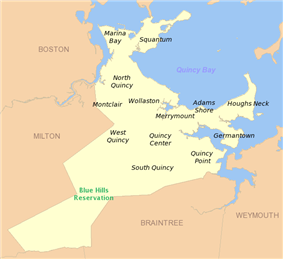 Quincy (pronounced ) is a city in Norfolk County, Massachusetts, United States. 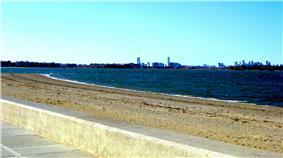 It is a major part of Metropolitan Boston and is Boston's immediate southern suburb. Its population in 2010 was 92,271, making it the 8th largest city in the state. 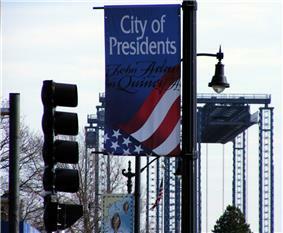 Known as the "City of Presidents," Quincy is the birthplace of two U.S. presidents — John Adams and his son John Quincy Adams — as well as John Hancock, a President of the Continental Congress and the first signer of the Declaration of Independence. Upon the departure of Wollaston, Thomas Morton took over leadership of the post, and the settlement proceeded to gain a reputation for debauchery with native women and drunkenness. 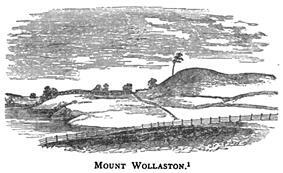 Morton renamed the settlement Ma-re-Mount ("Hill by the Sea") and later wrote in reference to the conservative separatists of Plymouth Colony to the south who disapproved of his libertine practices that they were "threatening to make it a woefull mount and not a merry mount". In 1627 Morton was arrested by Standish for violating the code of conduct in a way harmful to the colony and was sent back to England, only to return and be arrested by Puritans the next year. 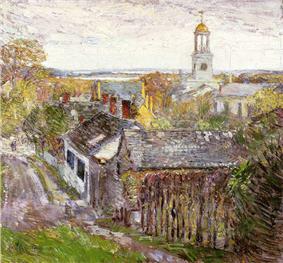 The area of Quincy now called Merrymount is located on the site of the original English settlement of 1625 and takes its name from the punning name given by Morton. ^ a b c d Encarnacao, Jack. "Quincy's Asian population surging" (Archive). The Patriot Ledger. March 23, 2011. Retrieved on September 8, 2015. ^ a b c d e f Eschbacher, Karen. "Immigrants from India a growing community in Quincy" (Archive). The Patriot Ledger. July 2, 2003 (from the summary page(Archive). Retrieved on September 8, 2015. ^ a b c Hsiao, Teresa. "WEEKEND TRAINING" (Archive). The Patriot Ledger. July 2, 2003 (from the summary page(Archive). Retrieved on September 8, 2015. ^ a b c Eschbacher, Karen. "Quincy’s Asian-American community is growing, changing" (Archive). The Patriot Ledger. June 28, 2003 (from the summary page(Archive). Retrieved on September 8, 2015. ^ a b Eschbacher, Karen. "Many anticipate Quincy is becoming THE NEXT CHINATOWN" (Archive). The Patriot Ledger. June 28, 2003 (from the summary page(Archive). Retrieved on September 8, 2015. ^ a b Fox, Jeremy C. "Chinese population expanding in Boston suburbs" (Archive). Boston Globe. Retrieved on September 8, 2015. ^ Eschbacher, Karen. "Asian American Bank's banking on success of new supermarket" (Archive). The Patriot Ledger. June 30, 2003 (from the summary page(Archive). Retrieved on September 8, 2015. ^ a b Eschbacher, Karen. "LOOKING TO THE FUTURE" (Archive). July 2, 2003 (from the summary page(Archive). Retrieved on September 8, 2015. ^ a b Eschbacher, Karen. "CLOSING THE DIVIDE" (Archive). The Patriot Ledger. July 1, 2003 (from the summary page(Archive). Retrieved on September 8, 2015. ^ a b Eschbacher, Karen. "Two Asian-American officers make inroads in neighborhoods" (Archive). The Patriot Ledger. July 1, 2003 (from the summary page(Archive). Retrieved on September 8, 2015. ^ Mann, Jennifer. "Quincy Chinese language school cleared of abuse allegations" (Archive). The Patriot Ledger. December 30, 2008. Retrieved on September 8, 2015. ^ "Operational Assessment and Potential Improvements"I-93/Southeast Expressway/Route 3 (Braintree Split): Boston Region Metropolitan Planning Organization, March 2006, p. 3. ^ Whitfill, Mary. "Lunar New Year Festival in Quincy is less than 2 weeks off" (Archive). The Patriot Ledger. February 17, 2015. Retrieved on September 9, 2015. John Adams - Second President of the United States, first Vice President, founding father of U.S.
Sam Mele - Major League Baseball and Manager who resided in Quincy while playing for the Boston Red Sox. The Lunar New Year is celebrated in Quincy. Quincy has had several football teams in the semi-pro Eastern Football League over the years. The current club, the Quincy Militia, played its inaugural season in the EFL in 2009. Founded in 2009 by long-time Quincy resident Vaughn Driscoll, new owners came into the team picture in 2013. Militia games are played July - October with home games at Veterans Memorial Stadium on Saturday nights. Quincy has had brief flirtations with professional sports. The Quincy Chiefs of the minor league Eastern Basketball Association (the predecessor to the current Continental Basketball Association) played a single season in 1977-78, and was coached and managed by former Boston Celtics executive Leo Papile. The Chiefs finished 12-19 in third place, and lost in the playoffs to eventual league champion Wilkes-Barre. Quincy's professional baseball team, the Shipbuilders, competed in the New England League in 1933, recording a 12-6 record before moving to Nashua midseason. The final season of the Boston Minutemen of the North American Soccer League was played at Veterans Memorial Stadium in Quincy, in 1976, finishing 7-17. 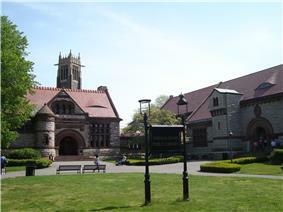 The Chung Yee School is another Chinese school in Quincy. As of 2008 the headmaster is Harry Kwan, who originated from Hong Kong. That year the school had 100 students and charged $100 ($109.54 adjusted for inflation) per child per month for Chinese language and culture after school classes. It was first established around 1996. The school was briefly closed by the Quincy Police Department in November 28, 2008 due to a lack of Massachusetts state and local government permits. After the state and municipal authorities cleared the school of allegations of child abuse, it was scheduled to reopen that year. Peter Jae established the Quincy Chinese Language School, which offers supplementary education for Chinese children, in 1988. As of 2003 it holds Cantonese language classes for 150 students at the Sacred Heart School in North Quincy on Saturday mornings. The school at one time had 400 students but the school reduced itself in size when a lack of qualified teachers occurred. In addition to the mayor, the city has a nine-member city council. Six councilors are elected to represent Quincy's wards, and three are elected at large. Councilors serve two-year terms. The city also has a school committee with seven members — the mayor and six members elected to staggered four-year terms. Other major employers with offices in Quincy are State Street Corporation, Blue Cross Blue Shield of Massachusetts, Harvard Pilgrim Health Care and Boston Scientific. TACV, national flag carrier airline of Cape Verde, has its United States corporate office in Quincy. 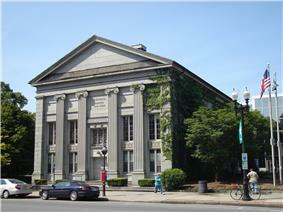 The Quincy office serves residents of Connecticut, Massachusetts, and Rhode Island. 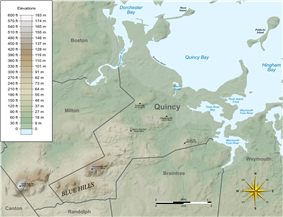 During its history Quincy has been known as a manufacturing and heavy industry center, with granite quarrying dominating employment in the 19th century and shipbuilding at Fore River Shipyard and Squantum Victory Yard rising to prominence in the 20th century. The recent decades have seen a shift in focus to several large employers in the financial services, insurance and health care sectors of the economy. 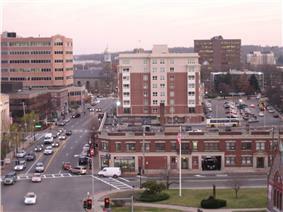 Quincy is the location of the corporate headquarters of several firms, including Boston Financial Data Services, the Stop & Shop supermarket chain, Arbella Insurance Group and The Patriot Ledger, publisher the South Shore's largest regional newspaper. In the 1980s some racial tensions, including violence, between whites and Asians occurred, and at the time the city did not employ any Asian police officers, leaving the Asian population to feel a lack of trust in the police. By 2003 the racial tensions had been greatly reduced, and the Quincy Police Department at that time had Asian officers. As of 2000 about 50% of Asians in Quincy own their own houses; many who rent do so while saving money for down payments for their houses. 65% of the Chinese were homeowners while only 10% of the East Indians were homeowners. As of 2003 slightly more than 2,500 Asian Americans in Quincy were registered to vote, making up almost 25% of Asians in the city who were eligible to vote. Historically Quincy residents traveled to shops in the Boston Chinatown but by 2003 Asian shopping centers became established in Quincy. 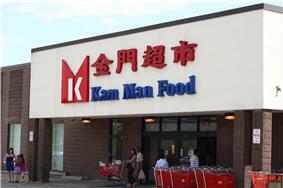 By 2003 New York City-based Kam Man Food was establishing a supermarket in Quincy. 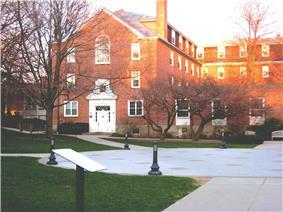 In 1980 there were 750 persons of Asian origin in Quincy. Most of the Asian immigrants coming in the 1980s originated from Hong Kong and Taiwan. In 1990, Quincy had 5,577 persons of Asian origin, with 143 of them being of East Indian origin. The number of Asians increased to 13,546 in 2000, with about 9,000 of them being ethnic Chinese, and 1,127 of them being ethnic East Indian. The latter group grew by 688%, making it the fastest-growing Asian subgroup in Quincy. Around 2003 most Asian immigrants were coming from Fujian Province in Mainland China instead of Hong Kong and Taiwan. At that time Quincy had a higher Asian population than the Boston Chinatown. The overall Asian population increased by 64% in the following decade, to 22,174 in 2010. 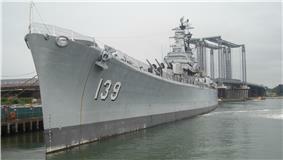 Quincy's Chinese population increased by 60% during that time period. As of 2010 Quincy has the highest per capita concentration of persons of Asian origin in Massachusetts. As of 2003 about 66% of the Asians in Quincy are ethnic Chinese, giving the city one of the largest Chinese populations in the state. There is also a community of persons of East Indian origins, with most of them working in information technology and other skilled professions. As of the 2010 United States Census, there were 92,271 people, 38,883 households, and 42,838 families residing in the city, making it the ninth largest city in the state. The population density was 5,567.9 people per square mile (2,025.4/km²). There were 42,838 housing units at an average density of 2,388.7 per square mile (922.5/km²). The racial makeup of the city was 65.5% White, 4.6% African American, 0.16% Native American, 24.0% Asian (15.6% Chinese, 3.2% Vietnamese, 2.6% Indian), 0.02% Pacific Islander, 0.85% from other races, and 1.76% from two or more races. Hispanic or Latino of any race were 4.6% of the population. 33.5% were of Irish (making Quincy the most Irish American city in the entire United States), 12.7% Italian and 5.0% English ancestry according to Census 2000. 77.1% spoke only English, while 8.0% spoke Chinese or Mandarin, 2.6% Cantonese, 1.9% Spanish, 1.5% Vietnamese and 1.3% Italian in their homes. 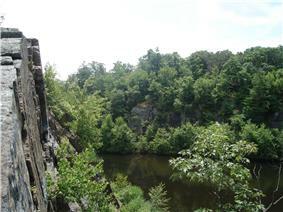 Among the city's several firsts was the Granite Railway, the first commercial railroad in the United States. It was constructed in 1826 to carry granite from a Quincy quarry to the Neponset River in Milton so that the stone could then be taken by boat to erect the Bunker Hill Monument in Charlestown, Massachusetts. Quincy granite became famous throughout the nation, and stonecutting became the city's principal economic activity. 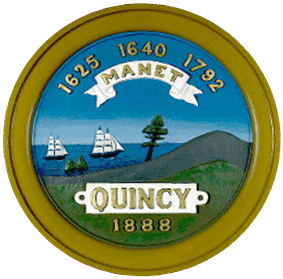 Quincy was also home to the first iron furnace in the United States, the John Winthrop, Jr. Iron Furnace Site (also known as Braintree Furnace), from 1644 to 1653. Quincy's population grew by over 50 percent during the 1920s.